Pyongyang, August 22 (KCNA) — Products from the DPRK won popularity at the 4th Rason International Trade Exhibition. Those products, presented by 20 companies, include fur goods, fine art works, handicrafts, different kinds of drinks made with natural vegetables and garments. The Rajin Drink Factory displayed Paekhwa Liquor, brewed with 100 species of flowers, which is very good for health as it contains rich amino acids and vitamins. The Rason Samdaesong J.V. Company exhibited various trucks. My company manufactures various types of trucks. It also produces containers and others by itself. We will boost production to the maximum by introducing streamlined process. Among the popular products were also tens of kinds of health foods, made of edible herbs, wild fruits and honey. Pyongyang, August 21 (KCNA) — A forum on investment in the Rason economic and trade zone of the DPRK took place on the spot on Aug. 19. It draws companies from Russia, China, Italy, Thailand and other countries taking part in the 4th Rason International Trade Exhibition. The participants in the forum viewed a video on the natural and geographical conditions of the zone and its development situation and long-term plan. They were also briefed on the legal guarantee for the zone development, business establishment and management regulations for foreign investors, the situation of foreign companies which have already invested in the zone, the vitalization of tourism, etc. Then, speeches were made by businessmen of different companies who are willing to invest in the zone. 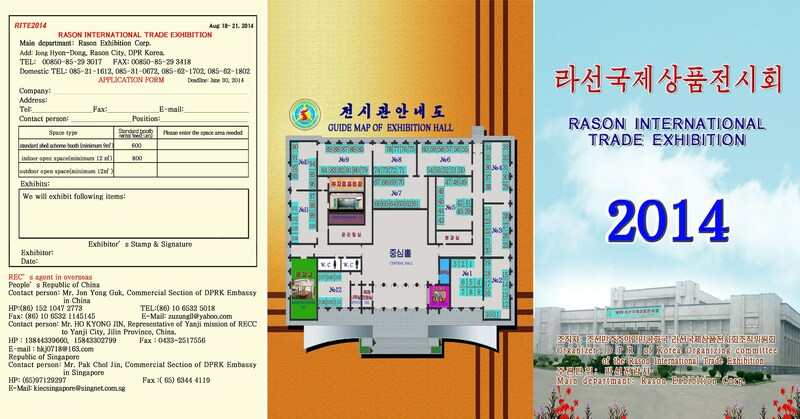 Pyongyang, August 20 (KCNA) — The 4th Rason International Trade Exhibition is going on in Rason City, the economic and trade zone in the northeastern part of the DPRK. In this regard, KCNA had an interview with Kim Hyon Chol, deputy director of the Department of Economic Cooperation of the Rason City People’s Committee. More than 100 local and foreign companies are taking part in the exhibition. The annual exhibition is intent on achieving the economic development common to the DPRK and other countries. Through the exhibition, businessmen have been acquainted themselves with the development of the Special Economic Zone (SEZ). And they are having discussions on the possibilities of efficient trade while making import and export contracts. The Rason City has been developed into an international region for relay transport, trade and investment, financial transactions and tourism. It is the third time for my company to take part in the exhibition. I have felt that progress has been made in every exhibition. And it has been well organized. 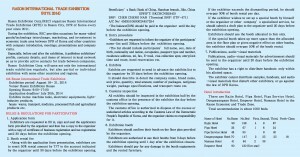 I hope that the exhibition will boost the cooperation between countries and regions. Especially, I want Russia and the DPRK to further develop the friendly cooperation in the fields of economy and trade. My company is making investments in producing foodstuffs like sea foods and planning to expand their production and volume of export. I want many more Russians to participate in the exhibition. It is the first time for my company to attend the exhibition and it feels good. The DPRK people’s living standard and rate of consumption are high as evidenced by the fact that new goods are popular among them. I was going to make an investment in the zone from a long ago and have invested in commercial buildings in the city. I hope that the economic trade zone would rapidly develop. Michael Basset also tweeted a photo of HBOil participating in the fair. Rason, August 18 (KCNA) — The 4th Rason International Trade Exhibition opened with a due ceremony in Rason City Monday. The participants in the opening ceremony placed a floral basket before the portraits of smiling President Kim Il Sung and leader Kim Jong Il displayed in the Rason Exhibition Hall and paid tribute to them. Attending the ceremony were Jo Jong Ho, chairman of the Rason City People’s Committee who is also chairman of the organizing committee of the exhibition, officials concerned, people in the city, and delegates of different countries, those who displayed products in the exhibition and foreign businessmen active in the Rason economic and trade zone. An opening address was made at the ceremony to be followed by congratulatory speeches. Speakers noted that the DPRK is dynamically pushing ahead with economic construction and has already laid an institutional and legal groundwork for developing and revitalizing the zone. They said that the zone is providing economic bodies and companies of various countries and the region with a favorable environment for conducting transit trade, processing trade and tourism in line with their will and wishes. They noted that the exhibition would offer a good opportunity for promoting the friendship and solidarity among countries and further developing wide-ranging and multi-faceted economy and trade. At the end of the ceremony, the participants looked round electric and electronic goods, light industrial products, foodstuff, daily necessities, medicines, vehicles, etc. displayed by at least 100 companies from the DPRK, China, Russia, Italy, Thailand and other countries. The 2014 flyer text is nearly identical to the 2013 flyer. All of the names/contacts/accounts/prices are identical. The only difference that I noticed was that two of the domestic phone numbers for the Rason Exhibition Corp. have changed. Two more remained unchanged. 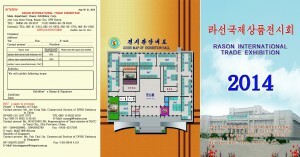 Here are posts on previous Rason International Trade Fairs: 2011, 2012, 2013. This entry was posted on Wednesday, August 20th, 2014 at 1:19 pm and is filed under Choson Exchange, Rason International Trade Fair. You can follow any responses to this entry through the RSS 2.0 feed. Both comments and pings are currently closed.